The Goddess who is worshipped during the famous Chhath Puja is known as Chhathi Maiya. Chhathi Maiya is known as Usha in the Vedas. She is believed to be the beloved younger wife of Surya, the sun god. Usha and Pratyusha are wives of Surya and Aditi is his mother. It's a divine submission to the Sun God. Devotees worship Surya or Sun God for his blessings. The spirit of the festivity is doubled due to the devotion and endless enjoyment of the festival. Celebrate the captivating festival with TheHolidaySpot. Loads of interesting information is given in this section on Chhath rituals, history, stages of Chhath, Sun meditation, tradition belief, 4 days of celebrations. Tickle your brain and answer the questions of the Chhath quiz. Colorful wallpapers are on display for you and your loved ones. Why is it super auspicious this year? This year (2019), the Chhath festival, which begins on November 13th and would end on November 16th, is falling on an auspicious period that has come after 34 years! The 'Raviyog', which is considered a sacred period as per the Vedic Hindu calendar is falling on the first day of the Chhath festivity, which also marks the Ganesha Pujan, making it a Maha Sanyog. Learn about the strict rules and arduous rituals of Chhath Puja. 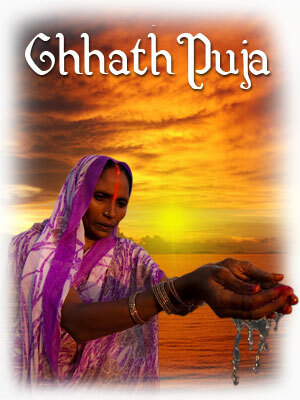 Know about the benefit of Chhath Puja. Acquaint yourself with the Chhath Puja rituals. Get to know the history behind the Chhath Festival. Adorn your desktop with wonderful Chhath Puja Wallpapers. Go through the different stages of Chhath Puja. Know the advantages of Sun meditation. Learn the traditional belief behind the ritual. Tickle your brain cells with these wonderful quiz. See Chhath puja through yogic viewpoint of view.